When Do Brooklyn's Pools and Beaches Open and Close for the Season? New York City boasts about 14 miles of beaches, mostly on the Atlantic Ocean, and hundreds of public pools, many of which are in Brooklyn. But when are they open, and when are they closed? Public outdoor pools in Brooklyn (and city-wide) are usually open from the Memorial Day weekend through Labor Day Monday. They are open seven days a week from 11 am to 7 pm. They do close for a half hour cleaning from 3:30 to 4 pm. After the outdoor public pools are closed for the season, you can swim indoors in public pools throughout the borough. Note that while the outdoor public pools are free some of the indoor pools are part of public athletic centers that may charge a fee. All public pools are absolutely closed after Labor Day, whether or not there's a sweltering heat wave in September. In the past few years a few trendy private pools have opened throughout Brooklyn. You can visit these pools if you purchase a day pass. In Williamsburg, for example, The McCarren Hotel and Pool offers guest passes to their outdoor luxury pool. Or you can head to the new rooftop pool at The William Vale Hotel. They tend to stay open until mid-September. When do the public pools open for the summer? 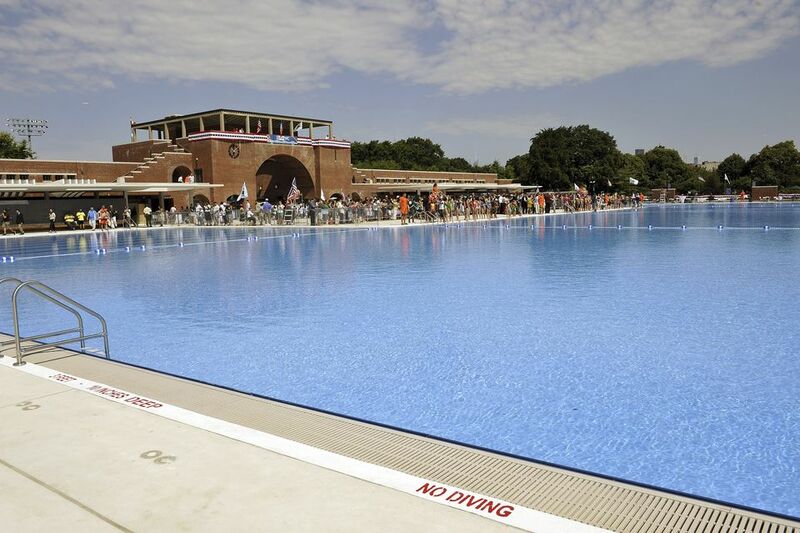 The NYC Parks Department announces the exact date of the pool opening in the spring on its website. Check with the Parks Department if you are interested in swimming lessons, senior swim or other special programs because they don't always start on opening day, but often a few days later. Dates vary. When do the public pools close for the season? The last day you can use the public pools is Labor Day Monday. Is the pop-up pool in Brooklyn Bridge Park a public pool? Brooklyn has a famous pop-up pool in Brooklyn Bridge Park that is open to the public. The rules are slightly different however. The pool is open from 10 am to 6 pm for 45-minute sessions. You must arrive a half hour before your swim time to get a wristband. There are lines for this pool, so getting there early is advised. The pool isn't as large or deep as other NYC pools, which makes it an ideal spot for families with young children. Next to the pool is a small man-made beach, where you can relax as you wait for your swim time. The NYC Parks Department maintains 14 miles of beaches, all of which are open from Memorial Day weekend through Labor Day. In Brooklyn the three sandy beaches are at Coney Island, Brighton Beach, and Manhattan Beach. When do the beaches open, with lifeguards? The NYC and Brooklyn public beaches open on Memorial Day weekend. All beaches are subject to health and weather-related closings. During beach season lifeguards are on duty daily, from 10 a.m. to 6 p.m. Swimming is prohibited when lifeguards are not on duty and in closed sections. Closed sections are marked with signs and/or red flags. When do the beaches close? The last day of the season is Labor Day Monday. It's both prohibited and dangerous to swim in the Atlantic Ocean without the protection of a watchful lifeguard. Many of the local beaches experience hard-to-detect rip tides. Every season people drown because they swim late in the season after the lifeguards have left.